Stockholm County had 927 590 overnight stays in hotels, hostels, vacation villages and camping sites in September 2010, which is an increase by 15 % compared to the same month in 2009. It was one the sharpest increases in the country in terms of both number and percentage. Stockholm County has had 7 688 491 overnight stays so far this year, which is + 6 percent compared to the same period in 2009. Summer of 2010: Almost 3.5 million overnight stays were made at hotels, hostels, vacation villages and camping sites in the county of Stockholm during June, July and August 2010. This is 168 000 more than last year and an increase of 5 %. 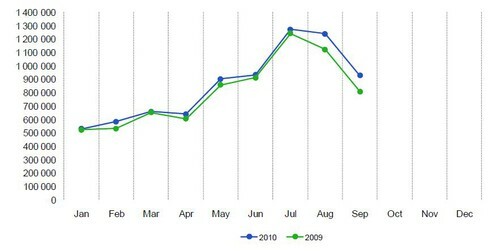 The rise in June and July were relatively modest whereas August surpassed last year's level by 10 %.